CLERKE (Clarke, Clerk), CHARLES, naval officer and explorer; b. 1741 at Weathersfield Hall (near Braintree), England; d. 22 Aug. 1779 on board the Discovery, near Avacha (Tar’ya) Bay, Kamchatka peninsula (U.S.S.R.). 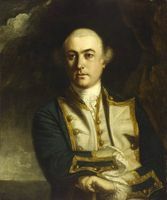 Charles Clerke, the son of a justice of the peace, entered the Royal Navy in 1755. 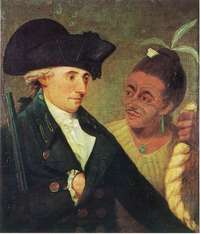 After serving throughout the Seven Years’ War, he became a midshipman on John Byron’s expedition around the world in 1764–66. On his return Clerke wrote a sensationalized account of the notorious “Patagonian giants,” which, despite its publication in the Philosophical Transactions of the Royal Society of London in 1768, was probably a hoax, for its author already had a reputation as a high-spirited young man. 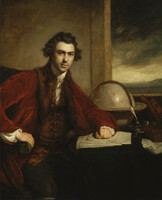 The turning point of Clerke’s professional life came in 1768 when he joined the Endeavour, under James Cook, as master’s mate on the first of the great explorer’s Pacific voyages. Clerke’s service began an association which lasted until Cook’s death. After promotion to lieutenant in May 1771 during the first voyage, Clerke sailed on the second voyage as second lieutenant in the Resolution; in 1776, now a captain, he was given command of the Discovery and sailed with Cook to the north Pacific in search of a northwest passage. Glyndwr Williams, “CLERKE, CHARLES,” in Dictionary of Canadian Biography, vol. 4, University of Toronto/Université Laval, 2003–, accessed April 22, 2019, http://www.biographi.ca/en/bio/clerke_charles_4E.html.